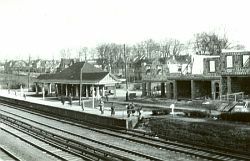 This black and white photograph above is not just a picture of the Long Island Rail Road station. It is also shows the adjacent two story Tudor Building under construction. Editor's Note: Click on the link below to see a photograph of a model of Kew Gardens own Homestead Building made out of Lego building blocks on another web site. If you click on the photograph, it will enlarge. Thanks to Matthew Bazylewsky for submitting the link. This is Rosalyn (Israel) Firemark, now living in Los Angeles. I graduated from PS 99 in 1954 and Forest Hills High School in 1958. I moved away from Kew Gardens in 1962 and lost touch with everyone. Contact the webmaster for my email address. I plan to attend the Richmond Hill HS reunion, Class of 1965 on Oct. 8, 2005 and I was hoping there would be another Kew Gardens reunion at about the same time. I didn't hear about the gathering in Nov 2003 until after it was over and don't know how it was organized. I do keep in contact with a few people from the Roger Williams (Marion Anschel, Bill Ballaine, John Specce and Jerry and Evelyn Springer), but would love to see more people from the neighborhood. If you have any information, please contact me at: devinejudy@hotmail.com. Click on thumbnails to view photographs. The attached photos are of Johanna (Jojo) Rosenthal and me, and were taken Monday evening at dinner. Jojo and I were reuniting after close to 40 years of no contact. Jojo's mother (Sivia Rosenthal) and mine (Rosalind Goldberg) were best friends in the 1950's and 1960's, and Jojo and I were classmates at PS99, class of 1958. I have just read today's article "The Statue of Civic Virtue" and thought it was extraordinary document! As a researcher I know how difficult it is to find all the missing pieces but I also know how exciting it can be to bring a story like this to life. You have uncovered many lost facts and cleared up a number of mysteries about this neglected and misunderstood statue. Your article was illuminating and thought provoking. To imagine that such a momumental Shakespearean lore can be found in our own backyard is staggering. Thank you for a masterpiece of literary intrigue and pathos. Love your site. When I was a kid, I lived in Bayside and my Mom would drive me to the E& F subway stop in Kew Gardens. I always thought, "I want to live here someday". To me, Kew Gardens is the perfect marriage of city and suburb - I call it "urban-suburban". In 1986, I walked into this apartment with parquet floors and a sunken living room, and (at that time) an unobstructed view of the Courthouse and said, "I'll take it", even though it is right between Queens Blvd and K.G. Road, and the traffic noise is pretty constant. Long before my husband and I met, he commuted from Huntington to Manhattan on the LIRR and passed the Kew Gardens station every morning. He always loved it and though he'd like to live here, too, just from seeing what he saw as he went by in the train. Ah, the allure of Kew Gardens. If this attachment works it is a picture of my mother, my father and me taken when I was about 5 or 6 years old, which makes it 1943 or 1944. We lived at 83-52 Talbot Street and this picture was taken on the then dirt road in back of the apartment house, the road ran parallel to the railroad tracks (forgot it's name). My father, Cliff Tatum, Sr. worked for the Long Island Railroad at the time, and my mother, Renee Tatum, was a stay at home housewife with her hands full taking care of me. I hope this is of some value in helping support the feeling of those magical times. 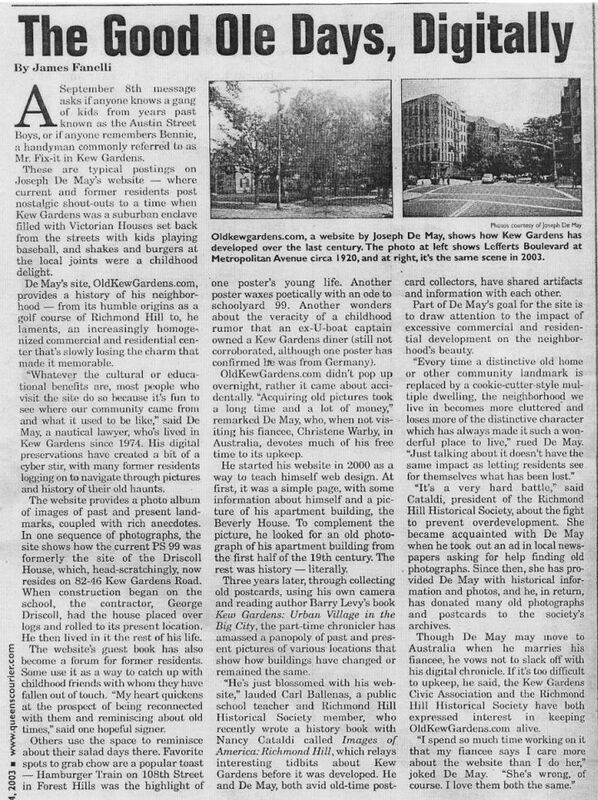 I lived in Kew Gardens from the time I came home from Booth Memorial Hospital until the 29th of May in 1967. At first, my parents lived in the Forest apartments, and then we moved over to the Garden apartments. We lived at 83-75 118th St, on the 6h floor, apartment 6J. My mom is still friends with some of the people she met while we lived there. Unfortunately, many of them are now gone. Among them were the Titowskys. My father and Bernie were such good friends. The Titowskys lived on Beverly Road. Rita died before Bernie did, but I remember them so fondly. In fact, in one of the photos taken in the Austin bookshop, I am sure another friend that Bernie also knew, (Les Bumas), is in a photo! The Bumas' still live in the same apartment they did fifty years ago in Forest Hills. While my father was an avid Red Sox fan, Bernie was an avid Yankee fan. Every year they would bet each other a case of beer, and the team that finished ahead of the other was the winner. I attended PS99, and had one wonderful teacher, Mrs. Charlotte Haver. As for the rest, let's just say the memories are just memories. I also remember Mr. Gray's bicycle shop, as I purchased my first "two wheeler" from him. He was such a gentle and kind man. I also remember a toy store up the street, on a corner, called "Wonderland". And, of course, there was the park. I took my first sled ride in that park. Summer days were spent there under the "sprinkler". In those days you could go in in your underwear and noone would care. I do remember Kew Gardens fondly. There was a really great place down the street from Key Food when I was small. They had train tracks that ran along the counter, and when your sandwich or whatever you had ordered was ready, it was set on the train and the man at the counter would stop it in front of you! (Even PB&J was good from a train). There also was an ice cream place called "Jahn's" that had tiffany style lamps hanging down, and a large bar with stools to sit and eat your ice cream. They also had a back room with a juke box, and if you were really lucky, your parents would let you have your birthday party there. (I never did, but my good friend, Kevin Laitman, had his 7th birthday party in the back of Jahn's). It's funny, but I can close my eyes and see all of the old neighborhood any time I want to. I guess it helps to have a photographic memory. 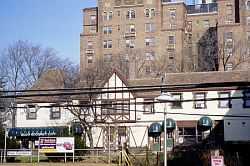 I lived in Kew Gardens from 1952 through 1969, in Kent Manor, and went to PS 99. The photos brought back wonderful memories (I have conveniently forgotten all of the not-so-pleasant ones). The Kew Gardens Civic Association will have its first flea market on Thursday, September 22nd, from 11:00 AM to 3:00 PM. Here’s your opportunity to clean out all those unwanted things you have accumulated over the years. Items should be clean, in good condition and small enough to be carried home. Donations will be accepted through the week of September 12th. The next poetry and music evening will take place on Friday, August 5th at 7:30 P.M. at the Bliss. Several new entertainers will be there, and it should be a lot of fun.